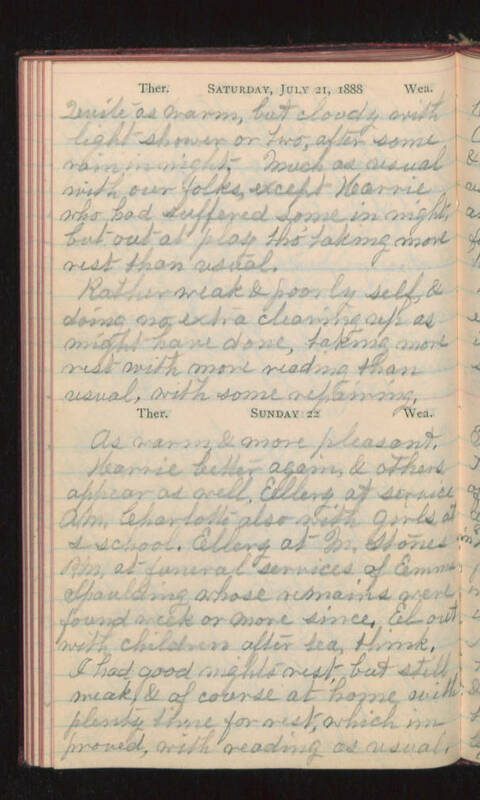 Saturday, July 21, 1888 Quite as warm, but cloudy with light shower or two, after some rain in night. Much as usual with our folks, except Karrie who had suffered some in night, but out at play tho' taking more rest than usual. Rather weak & poorly self, & doing no extra cleaning up as might have done, taking more rest with more reading than usual, with some repairing. Sunday 22 As warm & more pleasant. Karrie better again, & others appear as well. Ellery at service A.M. Charlotte also with girls at s-school. Ellery at M. Stones A.M. at funeral services of Emma Spaulding whose remains were found week or more since. El- out with children after tea, think. I had good nights rest, but still weak, & of course at home with plenty time for rest, which improved, with reading as usual.